Spice Place Cooking Forum > Cooking > Cookware > Thread: Red Pyrex? I have a friend who is getting married and she's doing her kitchen in red. As one of my gifts to her, I want to etch the bottom of a glass casserole (9x13"?). I was wondering if a red casserole can even be found. I have a blue one myself and I've seen green, but I don't know if I've ever seen a red one. does anyone know where I can find something like this? And it obviously doesn't have to be Pyrex brand - I'm not picky - but I also don't want to pay a ton because this is only part of a gift. You may not be able to find red glass that you can see through. Years ago pyrex did make red - but it was lined with white and definitely NOT see through. May I suggest that you contact an Avon representative? Avon sells beautiful red glass dishes and sides - they have an entire collection. That is the only red glass I can think of right now that is see through. It's a very deep bloody red. I think it is Corning that makes a cranberry colored glass. Check out various department stores or on line. I hadn't thought of Avon. I might give that a try. I'll also check out Corningware. Today the "retro look" is quite strong - you may be able to find a lot of red kitchen ware if you cannot find what you want. I hope you find something special! 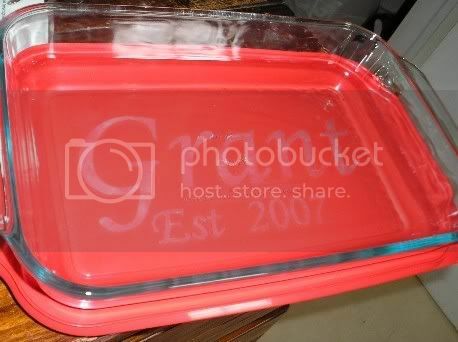 I didn't end up finding clear red bakeware, so I went with clear pyrex that has a red lid. It went over wonderfully!